Introduction of foreign DNA into the mouse germ line is considered a major technical advancement in the fields of developmental biology and genetics. This technology now referred to as transgenic mouse technology has revolutionized virtually all fields of biology and provided new genetic approaches to model many human diseases in a whole animal context. Several hundreds of transgenic lines with expression of foreign genes specifically targeted to desired organelles/cells/tissues have been characterized. 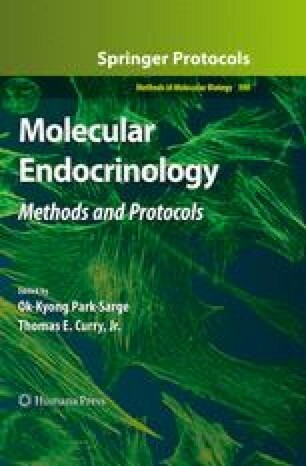 Further, the ability to spatio-temporally inactivate or activate gene expression in vivo using the “Cre-lox” technology has recently emerged as a powerful approach to understand various developmental processes including those relevant to molecular endocrinology. In this chapter, we will discuss the principles of transgenic mouse technology, and describe detailed methodology standardized at our institute. T.R.K. acknowledges funding support from NIH (NCRR Center for Biomedical Research Excellence Program Grant RR024214, HD04394, HD056082 and K-INBRE P20 RR016475) and The Hall Family Foundation, Kansas City, MO. H.W. is the recipient of a postdoctoral fellowship from the Biomedical Research Training Program at the Kansas University Medical Center.